We meet at In 2 Deep at 9:00am on your class and pool day where you will learn everything you need to know to head to the open water for your check out dives. We conclude by 5:00pm. Be sure to bring your printout from your PADI eLearning course and bring or wear your bathing suit, bring a towel, bottled water, a light lunch snack or light lunch and your personal scuba gear which all students are required to own prior to arrival (mask, snorkel, fins, booties and gloves.) All other gear will be provided. You will need a car to transport your gear (including tanks and weights) to the pool and back. 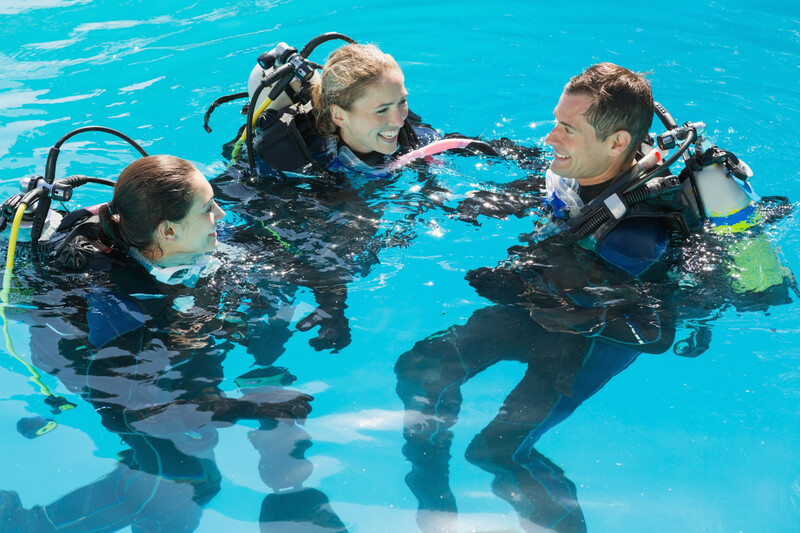 Prerequisites: You must be at least 10 years old, complete the PADI RSTC Medical Form (Dr. authorization may be required) and have completed the PADI online Elearning course. From In 2 Deep Diving, head towards the beach to 17th Street, make a left at the light. Stay on 17th until it dead ends into the school across Pico Blvd. Cross Pico and head down into the underground parking Structure #3 (a slight veer to the left) down into the parking lot, under the sign that says "Smoke Free Campus", (Do not go into the parking lot that is on Pico on the right.) Head down into the parking structure and at the dead end turn right (only direction available) and go all the way to the pool gate and turn left. At the far corner is the pool on the right and the field straight ahead. Park anywhere near the stairs and go to the (locked) pool gate.